If you are unable to read this newsletter, click here. On a small, probably unbuildable lot near Big Bend on Laguna Canyon Road, rows of lush green plants on vertical posts reach toward the sky. Walls of leafy greens—lettuces, chard, collards, spinach—cool the steamy canyon air. Sprawling tomato vines bend under the weight of colorful heirlooms and bunched cherries. There are chilies of every color and size, including small, pointy, lipstick-red Mexican Apache chilies, new to me. Shorter stacks of strawberry pots have their own section, with jewel-like fruit peeking out all over. It’s Alegría Fresh, the newest venture of serial entrepreneur Erik Cutter. After careers in marketing and magazines (he published Baja Life magazine for 16 years), he founded EnviroIngenuity, which develops and consults on sustainable, eco-friendly business. Cutter investigated the Verti-Gro hydroponic, vertical gardening system—he has a keen interest in nutrition, and gardened on the deck of his Bluebird Canyon home. He calls Alegría the farmacy—the plants are maintained with minimal water, no pesticides, and carefully monitored feeding to maximize nutritional content. Plain old dirt is just for underfoot, here—the growing medium in all the pots is coir, ground-up coconut husks, fantastic at holding moisture for the roots, but unable to support soil-borne pathogens like E. coli. But the point of the farmacy is to feed people, and “bouquets” of about 15 different greens, vegetables, and herbs, each enough for four or five family-size salads, can be ordered by phone to pick up at the growing site—they’ll have been harvested that same day. ($25; call 949-294-3554 to order.) Laguna Beach residents can also have bouquets delivered, starting at $100 per month for once-a-week service; delivery routes for other O.C. cities are planned. Or you can grow your own. 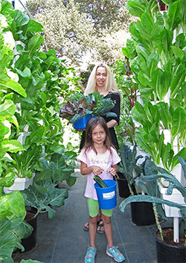 Alegria will deliver Verti-Gro hydroponic tower kits with everything you need for porch or patio, including your choice of plants (starting at $230). Info for all the plans is available at the Alegría Fresh web site.